Whether you prefer French tips, a gel finish, or powder dip nails, making time for a professional manicure is an indulgence — and not all of us have the time, money, or patience for a refresh every week. But thanks to beloved brands like O.P.I, Essie, and Sally Hansen stocked plentifully at most drugstores, Instagram-worthy nails are, well, at our fingertips. Formulas are better than ever overall, but when it comes to painting your nails yourself, the wrong techniques and bad habits can lead to polish-stained cuticles, smudges, and chipping. 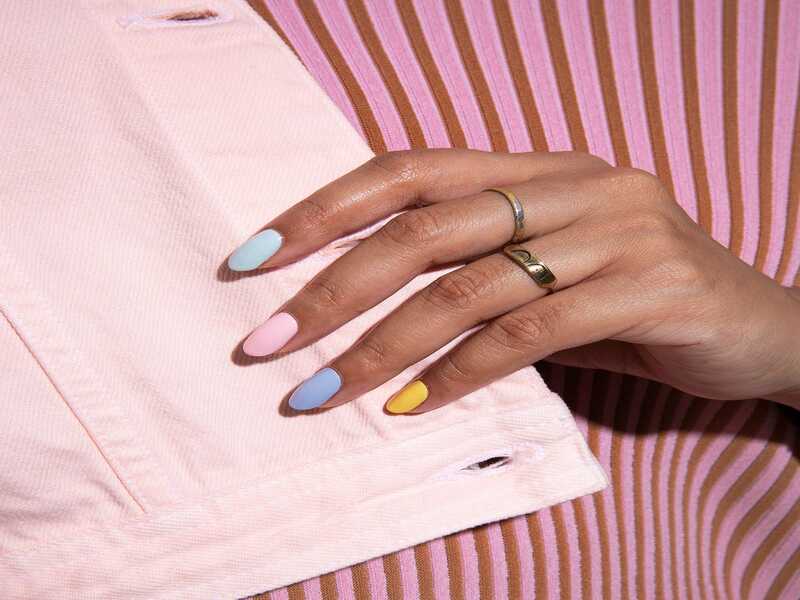 From following the expert-approved three-step method to upcycling old makeup brushes for quick clean-ups, here's how to perfect the art of the manicure at home, with a little help from pro manicurist Ami Streets. A salon-standard manicure starts with perfectly shaped nails, Streets says. "To achieve a great shape and the best finish, always opt for a soft nail file to prevent tearing or splitting your natural nails," she explains. And technique really matters: "File in one fluid motion with long, light strokes in one direction. Start from the outside edge and continue in a side-to-center movement," she says. This method will create a smooth finish and give you more control over the shape, too. Whatever you do, don't "see-saw." "Filing back and forth weakens nails, making them prone to splitting," Streets says. "Also, avoid metal or coarse nail files — both are too harsh for natural nails and can cause damage." For nail color that lasts well beyond three days, it pays to eradicate all traces of dirt, oil, and polish residue to give it a clean base to cling to. Once you've given your nails a once-over with a swipe of acetone (Streets suggests using a gentle formula, which will do less damage), it's time to buff. "Buffing is essential for perfectly prepped nails," Streets says. "Be gentle and sparing, using a soft and smooth four-way block or buffing file. Buffing brightens, smooths, and creates natural shine in addition to removing ridges, giving you a perfectly prepped base to paint on." Be careful not to over-buff, though. "Too much buffing can cause heat buildup and friction, which will damage and weaken your nails," Streets says. Three to four swipes on each nail is plenty. Firstly, always apply a clear base coat to your nails before painting to prevent staining, then go in with the color. "Aim to paint in three strokes," Streets says. "Starting in the middle of the nail, use the shape of the applicator brush to push towards the cuticle in a clean line." Then repeat on each side until the entire nail is coated. Try picking a nail polish with a flat, wide brush, which will hug the whole surface of the nail and provide better color payoff in fewer strokes. For brilliant shine, finish with a clear top coat. "Always 'seal' your polish by running your top coat along the top edge of your nail after application, too," Streets says. "This helps to minimize chipping and extends wear-time." Painting your dominant hand with your non-dominant is no mean feat, but you can minimize mistakes by assuming the professional nail-tech position. "Sit at a table with your elbows rested and your hands supported on the surface. Think of an arm rest or rolled-up towel for extra comfort, like in the salon salon," Streets says. "This will help keep you steady while you paint. Avoid overloading the brush with too much polish and aim to apply in just the three steps. Practice makes perfect." Top coat is your best friend when it comes to extending polish wear, but not just after you're done painting. "To extend wear and avoid any chips, reapply your top coat and cuticle oil every one to two days," Streets says. "A little maintenance means your manicure will really last and continue to look perfect." "The secret to a rapid-dry manicure is to perfect the art of layering by keeping each coat of polish as lightweight as possible," Streets says. Quick-drying formulas help, too. "Good quality polish and top coat will ensure your manicure dries super quickly with great shine," she says. "Complete it by applying oil to your cuticles after a couple of minutes. The oil not only hydrates nails and cuticles but will also help you avoid any smudges during drying time." Alternatively, applying a cool breeze works just as well. "This on-set and in-salon trick can easily be transferred to home by simply using your hairdryer on the cold setting," Streets says. "A blast of icy air can help to set nail polish in an instant. Hold about six inches away from your hand for around a minute for best results." This is where your old makeup tools come in handy. Instead of a cotton bud, which will only end up in landfill, take a flat eyeshadow brush, dip it into remover, and carefully run it around the edges of your nails or the skin on your fingertips to clean away any excess polish.